Suitest provides advanced tools for developing and testing webOS applications on LG Smart TVs. After setting up your webOS device with Suitest you will be able to create and execute automated end-to-end test scenarios as well as debug your applications directly on the webOS device. webOS devices are operated by the CandyBox. You can purchase the CandyBox through your account. A single CandyBox can independently control 8 or 40 devices and you can have as many CandyBoxes as necessary in your account. Download the Developer Mode application from the webOS Content Store. Run the app and sign in with your LG developer account. You can get a free account at LG developer site. 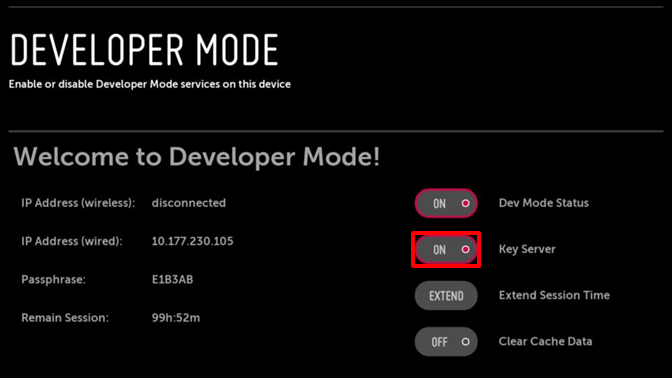 Navigate to the Dev Mode Status and switch it to ON (see screenshot below). Wait until device reboots, then open the Developer mode application again. Navigate to Key Server and switch it to ON. Make a careful note of the device IP address and the passphrase (or snap a picture of the screen with you phone). Developer mode session will expire after around 100 hours unless you extend it. To extend this you need to open the Developer mode application, navigate to the Extend button and press OK on your remote. You won't be able to run tests on your device with the dev session expired. TIP: You can lay out the steps necessary to enable the dev mode in a Suitest test and then have Suitest execute this test periodically when you are away. We recommend that you take the effort of determining this information as accurately as possible since that will save you from several potential misunderstandings in the future. Static IP address: To prevent connection failures due to the device IP address changes you should consider configuring your DHCP server to assign static IP address to your device. Same network: For Suitest to operate the device correctly, the device and the CandyBox must be connected to the same local network. Sleep or power-off: Some devices have sleep or auto power-off features which turn the devices off after some period. Please make sure that your devices are set to never sleep to avoid interfering with tests. Consult your devices user manual on how to do so. Follow the detailed instructions on how to install the infrared blaster in the CandyBox article. If this is the first time you are adding a device operated by the CandyBox you should first set up the CandyBox itself by following the CandyBox installation guide. Open the Device wizard, select Add physical device, choose LG webOS from the platform list and then press Next. Device wizard will now request information about your device. Enter the information that you have prepared previously and press Next. Note that all the information is required except for Firmware. To operate the device Suitest needs to know the exact infrared signal to send for every key. Suitest has a database of many such device drivers. Based on the previously entered information about your device Suitest will look up driver candidates and offer you to verify their fitness or to record your own set of keys. The process of assigning a driver is similar for all platforms and is described in the Smart TV's article. To complete the configuration enter the passphrase that you have written down from the Developer Mode app and press Next. The rest of the process will complete automatically. After this the LG webOS device will become available in your Suitest account. Now that you have your webOS device configured, it's time to instrument your app and start testing.